Eyman performed well, but Roach was the star. UPDATE: Pam Roach received a letter from Lt. Gov. Brad Owen regarding her behavior in this hearing and others. The link to the story is at the end of this post. NOTE: We have placed a survey on the right relating to this post. John Stang from Crosscut provided us a great rundown on a hearing of a bill that made it into committee last week in the Senate but isn’t likely to make it out. I got interested in the legislation, which would call for more reporting and training on paid signature gatherers, because in Tim Eyman’s email he described it as the hearing blowing up. He was right. For me it was an amazing show mostly by Senate Government Operations Committee Chairwoman Pam Roach, an Auburn Republican. I’ve never witnessed a Roach-led hearing before and if they’re all like this I don’t think I ever want to miss another one. It began when the Fred Meyer/QFC’s Melinda Merrill dared say store customers were being harassed by signature gatherers at their stores. Roach was willing to entertain that idea for somewhere south of a couple seconds. As Stang reported, Roach wondered if Merrill could provide names. Merrill could not but vouched for the honesty of their customers and store employees. There were four reps from grocery stores there, and Roach took every opportunity she could to interrupt to turn the conversation to one about her last election, which she reminded the audience she won. This was less a hearing about the deportment of signature gatherers than it was about payback for grocery store lobbyists favoring her opponent in November. It was a show that didn’t need Eyman to spice it up, but he was there. Eyman, if you’re new to these parts, is most often identified as Washington’s “initiative guru,” having turned a passion into a living several years ago and working every year to generate mostly tax-saving ballot measures. 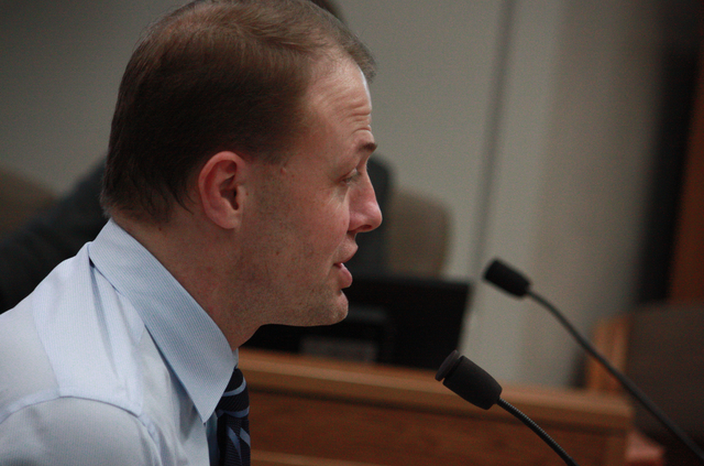 Eyman not only dismissed the claim that a signature gatherer would harass any customer, he said it was a strategy by opponents of his initiatives to go into store managers and falsely claim that they were harassed. And while I don’t cotton much to conspiracy theories, my own experience makes me wonder if he has a point. So here, and in the right rail of this blog, is my question. I think Sen. Roach would appreciate you answering, too. Have you ever been verbally harassed by a signature gatherer? Yes or no, go answer the survey. If yes, Sen. Roach wants to hear from you if you’re willing to provide your name. At least that’s what I think she was inviting at the hearing. The reason I ask is because I haven’t told a single signature gatherer “yes” to signing any initiative in the 14 years I’ve lived in this state and I’ve only experienced anything close to harassment twice. Both times it was when a reporter tried to explain that we reporters don’t sign those things, ever. The first one was at the Seattle Center when a friend of mine made the mistake of trying to explain why to someone who clearly had ingested so much Red Bull that the sensitivity portion of his brain had been snuffed out. I say my friend made a mistake because there was plenty of room to walk away from the miscreant, but my friend wanted him to agree. The second time, though, was here in Bremerton when there was a meeting about Washington State Ferries and there was a petition being circulated dealing with a local ferry initiative. A reporter from a rival paper tried to explain why she wouldn’t sign a petition and the ferry zealot tried to talk her into it, as if her several minutes of badgering would override years of being told by journalism professors and bosses that signing a petition is no better than planting a campaign sign in your yard or your copy. Still, she persisted, shutting up only because the meeting was starting. Other than those two incidents, I can’t remember a single time an initiative gatherer tried to get strong with me. I say “No, thank you.” and walk inside the store. I’ve sensed disappointment, but I don’t stick around long enough to verify it. This is why I want to ask you whether you’ve ever been addressed more aggressively by a signature gatherer than you’d like. Story commenter dardena said he was by someone gathering ink for Initiative 502, the one dealing with marijuana. Lest you worry, this legislation’s sponsor, Democrat Marko Liias of Lynnwood, told Stang he didn’t think the bill would make it out of committee. If true, this means we don’t need to discuss the merits and cons of the legislation. A similar bill that received 71 votes in the House last year got blasted by newspapers and didn’t get far in the Senate. Again, though, the entertainment factor provided by Roach was stellar. I’ve never seen a committee hearing that was so much about the committee chair. If only someone had thrown Roach a football she could have spiked like Gronk. The four-page letter obtained Monday by The Associated Press was sent to Roach on Friday. In it, Owen states that her “abusive behavior” must stop. He also informs her that she can only meet with nonpartisan committee staff when in the presence of another senator on the committee, Republican Sen. Kirk Pearson. In the original post here we didn’t mention a couple other moments that might be sparking the concern from Owen. At one point a committee staffer reads the information about the bill. There is nothing remarkable about his reading and is done as it has been in every other bill hearing I’ve witnessed. These bills are also discussed at length after these reports, so in some sense the non-partisan staffer’s reading appears some pro forma. But Roach told him that next time he ought to slow down. She wasn’t harsh, but that’s not something I’ve ever seen in committee, and his reading was not at all unusual. Another piece that Owen doesn’t mention is that during the committee hearing Don Benton, a Vancouver Republican who with every Senate Democrat helped Roach take the Senate Pro Tempore position away from Democrat Tim Sheldon, questioned Sen. Marko Liias’ argument that Washington State Patrol had nine investigations on signature gatherers during a recent election, but because of lax reporting requirements could only fully investigate one of them. Benton said he found that hard to believe. At the end of the hearing Liias wanted and opportunity to respond with his evidence, but Roach wouldn’t let him, saying she had to keep control of the hearing. I can say I have never been “harassed” by signature gatherers, cookie sellers or donation gatherers but I can say that when I pull into the parking lot and see something of this sort camped out in front of the store, I will most times drive on back out and head down to road to a store that does NOT have this type of activity going on. Have a few signature gatherers, I have run across, bordered on aggressive in their asking? Sure, they have. Have I heard a few mumbled less than flattering adjectives about myself when I have cut off their spiel and said No Thank You? Oh, yes I have. I can see where stores are legitimately concerned about losing business because of this. Pam does make for entertaining political theater. Steve, no, I have never been “harassed” by signature gatherers, although there were times I had wished that they weren’t around. The only times (few) I have ever signed a petition is when I already am aware of the issue, and wish to support it. I want to join in on the subject of signature gatherers for initiatives put forth by voters. I have never been strong armed or pushed into listening to a signature gatherers support for an initiative, rather I relish the opportunity to hear another perspective on a subject, or an opportunity to examin a signatures takers background and knowledge the subject initiative. I believe in Americas citizenry being heard, and our elected representatives listening to the voters. Any push to hinder that process is a hinderance to the publics ability to make itself heard.